Fastball Questions: Talking X-Men With Writer Chris Claremont – AiPT! The X-Men have gone back to basics – so much so that the recent X-Men: Gold #1 was actually titled “Back to Basics Part 1.” While Marvel likes to think its mutant franchise is all about change, it always seems to find its way back to those classic X-Men tropes, such as super-powered baseball games and soap opera romance, that made the misunderstood heroes the Hollywood stars they are today. And the man who established those tropes is none other than legendary X-Men scribe Chris Claremont. The writer, who co-created X-Men: Gold team leader Kitty Pryde and team member Rachel Grey (among countless others), was in Massachusetts April 8 for New England Super Megafest Comic-Con – and so was I, reporting for AiPT! No way was I going to pass up the chance to ask the writer who made the X-Men the heroes I love today a few questions. If you’ve never seen or spoken to Claremont at a convention, you may not believe that the co-creator of Mister Sinister is actually pretty goofy. At a Megafest Q&A session with writer and artist Mike Grell, Claremont – who studied acting in college – pretended to doze off the second he slouched into a comfy-looking chair on stage. What shouldn’t come as a surprise is that Claremont loves to tell a good story. The writer, who is known for his verbose word balloons, regaled the crowd with the story behind Marvel Team-Up #74, in which Spider-Man joins forces with the John Belushi, Bill Murray and the rest of the original Saturday Night Live cast. Yes, the man who tortured the X-Men for so many years seems to be more Spider-Man than Wolverine at heart. He also does a great Stan Lee impression! Something else you quickly realize about Claremont at a convention – he’s popular. Like, Wolverine popular. If you wanted to chat with Claremont, or get a signature or 10, you had to wait. AiPT! : Have you been following Marvel’s recent X-Men comics? 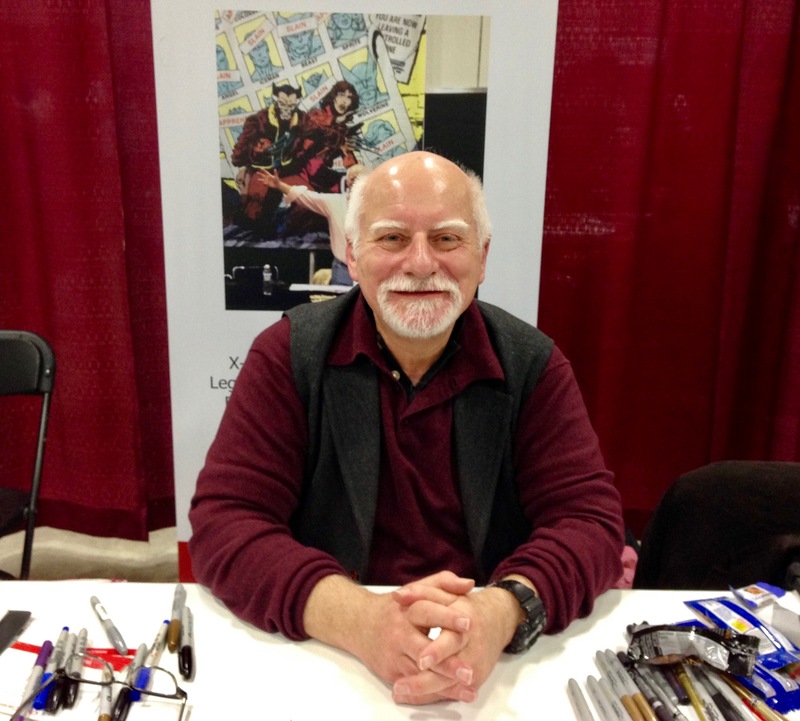 Chris Claremont: I haven’t read a Marvel comic or any comic in four or five years. AiPT! : Well, Marvel has gone back to basics with the X-Men, using a lot of the tropes you established. In your opinion, what is it you and your collaborators did back in the day that makes these ideas so attractive to Marvel? Claremont: Really good stuff? That’s a question you’ll have to ask the editors and writers involved. AiPT! : What can you tell me about the plot of the X-Men movie you and Stan Lee pitched to James Cameron in 1990, that would have been directed by Kathryn Bigelow? AiPT! : You’ve said Bob Hoskins for Wolverine? Claremont: Bob Hoskins and Angela Bassett for Storm. AiPT! : Final question – You’ve written Cyclops in various stages of his life. Who is Cyclops’ true love? That wasn’t the end of the answer, though. In true Claremont fashion, the legendary writer had one more story to tell before I left his table. Claremont – who was forced to kill off Jean Grey in Uncanny X-Men #137, wasn’t pleased with the idea of the character returning in X-Factor #1 – and especially to Cyclops’ life, as he had moved on, married Madelyne Pryor (later revealed to be Jean’s clone) and had a baby. Claremont: There’s no happy way to end this. You have a father and a husband walking out on his wife and child for his first girlfriend. And you can say what you like about the first true love, but he swore an oath before God and man that he would love her and be faithful to her, and now, okay, circumstances have changed. My point – there’s no way a comic hero can recover from that and still be a hero. So my pitch to [then editor-in-chief] Jim Shooter was you have a perfect alternative to Jean in Sara Grey. Jean has a sister. Bring Scott back to the team with Madelyne, with the baby. Scott is now the Xavier character – he’s the leader. We already know that Madelyne doesn’t like him being in the superhero life, there you have instant tension. Stress. Who knows where that can go or will go. They might even split up, or not. It’s sometime in the future, but you’re building on an organic base. In the meantime, you have Sara, who’s unencumbered as far as we know … we hinted she had children. And we have Bobby and Hank and Warren. So for the first time in the history of the X-Men, they are suddenly key members. You have the action circling around those four characters, with Scott in the Xavier role on the outside. To me, that was a much more organic, positive and progressive way to deal with the concept. And Sara’s powers could be integral to the series because she’s the living mutant detector. She can look up a new mutant, and with her power, activate their power temporarily. It would give her something unique to do. And it would be fun … to me it’d be fun. And Jim liked the character and liked the concept. Unfortunately, he’d already given his guarantee to everyone involved with X-Factor and wouldn’t go back on that, so he said no. I didn’t have the heart to tell Claremont that Cyclops went on to kill his mentor Professor X a few years back. I guess Claremont was right about no comic hero being able to recover from abandoning his wife and child for his original flame. What I did do is thank Claremont for taking the time to chat with me. In a time when true comic journalism is taking a backseat to more click-friendly features and throwaway content, conventions like New England Super Megafest Comic-Con continue to provide a venue where creators and their fans can go beyond the panels.